It's April 28 today, not quite May yet, but the first rain after the hot spell just fell. Gee, did summer go that fast? My children have been complaining the whole day how hot it was. Then as if on cue, the first drops of rain were heard. It only took three words from their father to send them scampering outside in a second. "Ligo sa ulan!" (Bathe in the rain). When the small scattered drops gave way to a full shower, there was nothing to stop them. I grew up hearing from the elders in our family how the first rain of May is supposed to be beneficial in terms of luck and curing skin certain skin conditions. Some even believe that rain that falls exactly on the first day of May is holy and blessed and can be used to drive away evil. Such rain is often referred to as "Agua de Mayo". I'm not really sure about all these beliefs but the first rain of May never fails to bring back the moments when those ideas were introduced to me. I told my own children about them. I have to admit though that I stressed the part of enjoying bathing in the rain more than anything else. 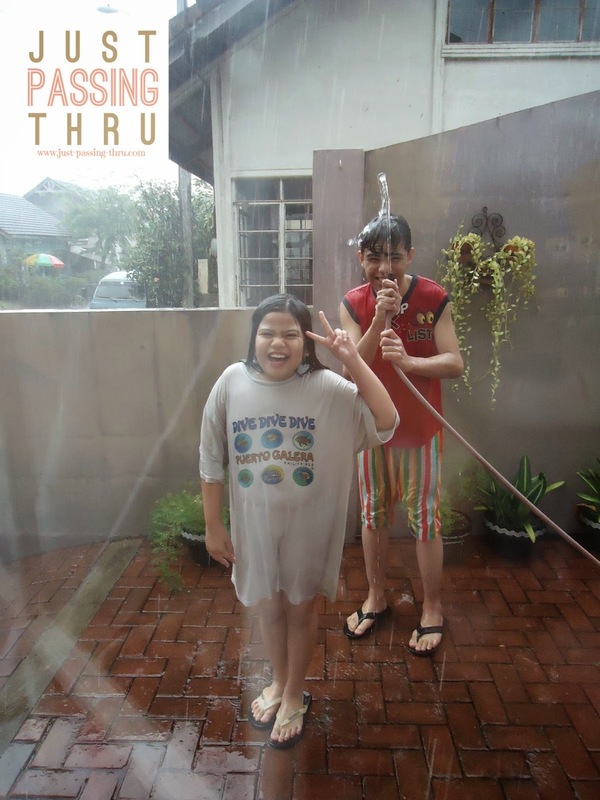 Bathing in the rain was part of my childhood. It was probably one of the rare times when my siblings and I were not cautioned against getting wet under the rain by our elders. While getting wet under the rain is usually avoided so as not to get sick, the first rain of May offered an excuse to enjoy the wonder of nature. My brothers who were of course more adventurous than me, even submerged themselves in rain puddles. Back then, we were not concerned about the bacteria and viruses lurking around. Ahh... but the environment was a lot cleaner then. Watching my children enjoying themselves under the rain made me remember that there are still things in this world that can be enjoyed for free. I marvel at the speed of their reaction when they were told to go bathe in the rain. They left their computers without any second thoughts and even requested me to just close it for them lest the rain stops at once. They called on me to join them. That said, a part of me wanted to join them especially when my husband hosed them with water much to their delight. Sad to say, the adult prevailed over the child in me as it took me quite some time to decide because " I have so many things to do". The rain stopped while I was thinking. This should remind me to let the child in me prevail once in a while because chances to enjoy the simple things in life may be gone before I have the luxury of having nothing to do. That indeed would be very sad. The UN has declared several years ago that "access to safe and clean drinking water and sanitation is a human right essential to the full enjoyment of life". This declaration brings to light the fact that safe drinking water can be a scarce resource in some countries. Judging from the constant presence of the all-familiar blue water containers found in many Filipino households as well as the high sales of bottled water, the Philippines can be said to be one of those countries. On the other hand, I am one of those mothers who are increasingly getting bothered by the dent being created by the need for safe drinking water on the household budget. There must be a better way to do this without sacrificing the health of my family. It is a good thing that I found Pureit Water Purifier but that is getting ahead of my story. For many years now since it was determined that the water coming out from faucets in many areas in the Philippines is not safe enough to drink, households were left with at least three choices. First is to buy bottled water from groceries or supermarkets. Second is to buy from water refilling stations. The third option is to use a water filtering gadget to filter the sediments. However, each option presented its own challenges. Bottled water is fairly expensive for daily use. Water refilling stations are not created equal as not all are able to maintain the required standards for cleanliness and safety. Water filtering gadgets are not able to provide protection from viruses and bacteria. We have opted for the second option in our household. We have two blue containers and one clear container that is typically used in water dispensers. Several times in a week, we go to the nearest water refilling station and have them refilled at PHP 40 per container. That was the lowest price we can find among the more decent-looking water stations in our area. The accumulated weekly cost was really getting burdensome. This is not to mention the occasional aggravation of finding out that we are out of drinking water when all water stations have closed for the day. We are personally not inclined for water delivery since we don't want to be using water containers other than ours. Thus, it was really quite an effort to drive to the water refilling station or very costly if we would opt to pay a tricycle driver to do the task. Tricycle fare is unbelievably high in our area. 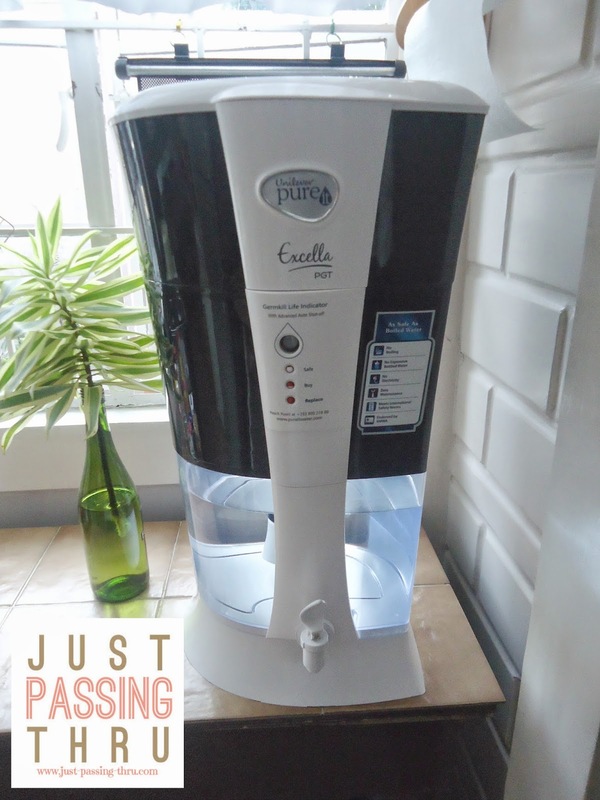 It is certainly a good thing that I got to know of the Pureit Water Purifier from my sister-in-law, Levy. Reading through some materials she had about Pureit convinced me to try it. Of course, it helped a lot to know that the product is backed up by Unilever, one of the most reliable companies in the country. I like it that Pureit does not use electricity. I like it that it is able to remove viruses, bacteria, and parasites. But most of all, I like the fact that my family is assured access to safe drinking water any time of the day as long as we take care to have Pureit stocked with water. It is the next best thing to the convenience of getting water straight from the faucet. And so that is how my family got to have access to safe drinking water at less cost. There may be an initial investment of about PHP 5,000 but actual savings will manifest itself in a matter of months. There will also be a need to change the Germkill Kit which is responsible for ensuring safe drinking water, after some time but the overall cost is still much lower compared to buying water. That said, Good health is really essential to living a quality life. With life already challenging as it is, I wouldn't want to be constantly worrying if the water we are drinking is safe or not. I've got better things to do with my family but we can only do them if such basic things as safe drinking water is taken cared of. No, this wasn't planned at all, spending Palm Sunday morning in the busy and crowded Quiapo Church that is. I easily get nauseous in crowded places and I would happily settle having my palm blessed in a church where there are less people. Actually, I have been doing exactly that for so many years now until I found myself in Quiapo last Palm Sunday. 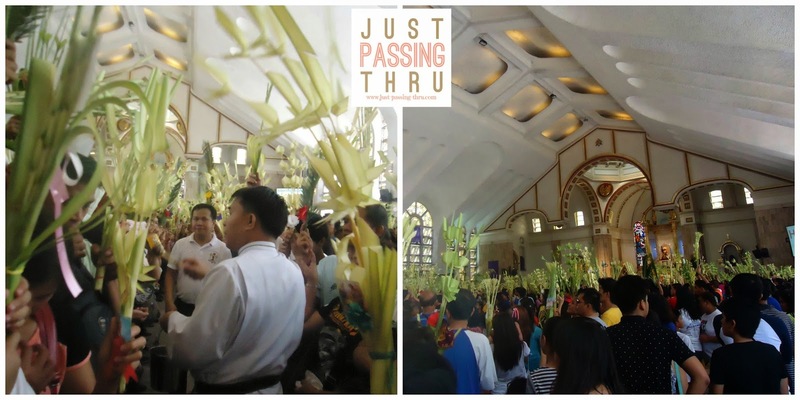 So I did the unthinkable (for me) and dove straight into the sea of palms held by sweaty hands like mine, enduring the heat inside the church to perform one of the Lenten traditions that I have known all my life. If you are one of my regular readers, you would know I am no stranger to Quiapo. In fact, I spent a lot of time here because of our family restaurant Ambos Mundos Restaurant. But back then, I had my mother to assist me when I felt faint due to the heat and the crowd. Part of my prayer that Palm Sunday morning was for me to survive the one hour mass without making a spectacle of myself by fainting and it was granted. It might be my sentimental side running on full gear again because I felt that unmistakable feeling of oneness with the faithful who were hearing the mass that morning. These are people I do not know and would probably never know. I felt everyone's need to unburden their troubles just like me and saw it on their faces with eyes closed shut, intent on prayer. "Ay salamat, salamat" (thank you, thank you)...these are the exact words uttered by an elderly woman beside me after being showered by holy water while the palms were being blessed. It is as if what we just went through freed her from her earthly anxieties and troubles. Her face showed her genuine happiness and I wondered just how good it must feel to be that way. It is without fail that the Quiapo Church will always beckon to me to come in, regardless of the purpose I may have for coming to the place. Maybe because my family has hurdled a lot of troubles through prayers uttered inside this church...maybe because God knows one of the heaviest burdens I carry is associated with this place...or maybe because I simply need to rest my tired mind and exhausted body. That said, I know God knows. During the Lenten Season, most people would only be thinking of two things: spiritual enrichment and physical relaxation. Many plan out-of-town trips while others choose to stay close to home while observing traditions associated with the season. It has always been the latter for our family because we grew up believing that the days of the Holy Week are best spent rejuvenating spiritual and familial connections. I spent Holy Tuesday night watching a modern cenakulo entitled "Bunga ng PagGAWA" with my family. It was actually a first for all of us in such setting. My husband and I had watched once in different places during our younger days but those were a long time ago. We could hardly remember the details but of course the universal message of Christ's supreme sacrifice remained with us. 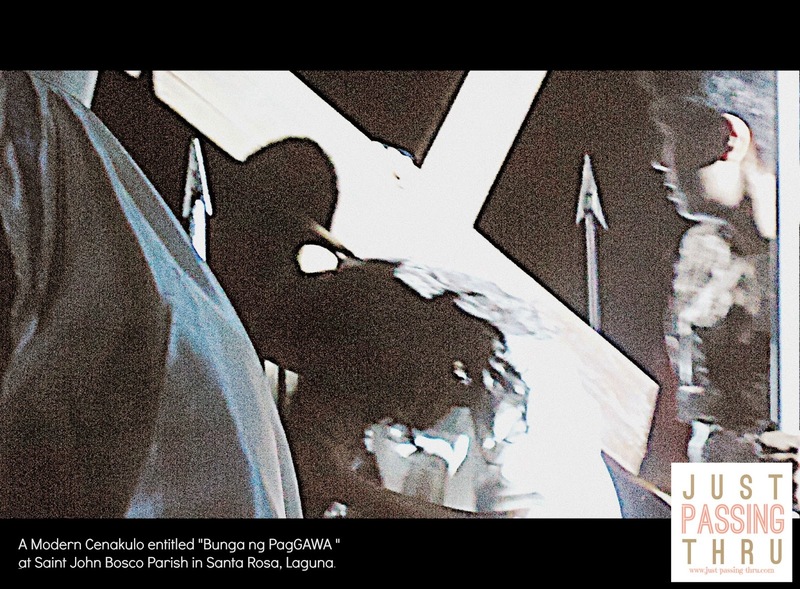 A cenakulo is a Lenten play which depicts events related to the life, suffering, and death of Jesus Christ. 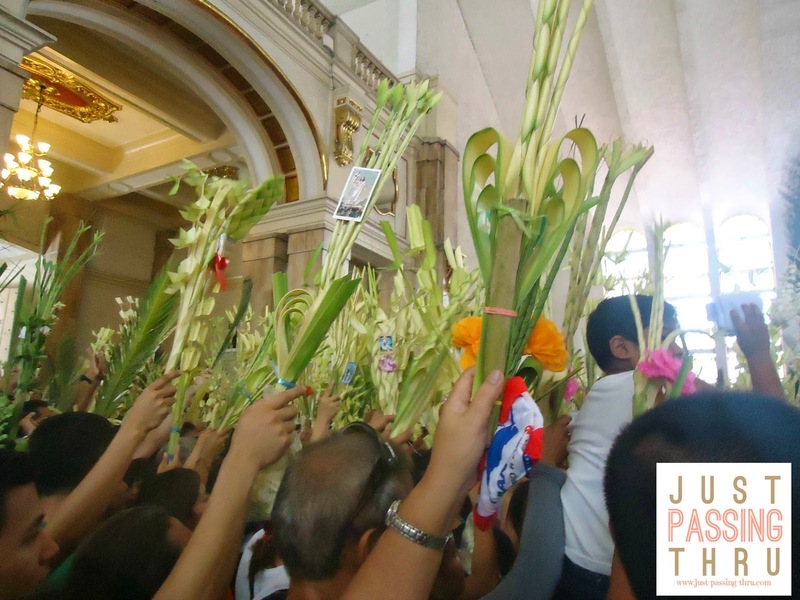 Tradition has it that a cenakulo is presented for at least eight nights starting from Palm Sunday up to Easter Sunday. The modern version, like the one we watched, usually runs for an hour or two. 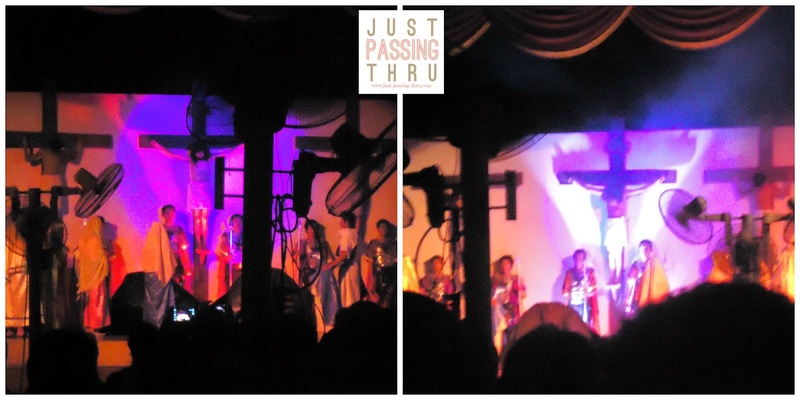 It is usually performed on a stage with a telon serving as a backdrop. This allows for smoother scene transitions and movement of performers. It can also be performed in open spaces like streets.The one we watched had the Christ performer dragging his cross around the venue and I must say it had quite an effect on the audience especially to the children. This was especially so when the Roman soldier started whipping Christ and the wailing of the crying women was heard all over. What is the Message of the Cenakulo? My daughter's innocent question as to what the real message of the cenakulo is, again led me to deeper thinking. I must admit I have often taken such depictions in their face value. I was taught that Christ went through Crucifixion to save mankind and that was that. When my daughter asked if it was possible for Christ to have saved us without going through such suffering, I said of course. As I grappled for some more explanation to provide her, it slowly dawned on me that Christ's submission to this particular sacrifice was not a sign of weakness or being less godly but rather to show us the way in carrying our own crosses. The show effectively linked Christ's Passion with how we should be facing our own ordeals with courage and resoluteness. The show was in every way successful and was made possible with the combined efforts of the church leaders and the parishioners. The parish priest said in his message that it was far easier not to do any preparation of such sort but poses the question as to what good doing nothing would do for all of us. It was a message well received and understood. That said, there are many more Lenten activities lined up for the rest of the Holy Week and our family would try harder this year to participate more. We hope to do this not only to continue a long-standing tradition among Filipino families but also in the hope that our family will become even more close and united. This is our faith in motion. Every year before the end of the school year, my children's school never fails to send out communication about the availability of the flu vaccine. Every year, at about this time when summer starts, my two children get their shots. Getting the flu vaccine is considered essential in avoiding the flu. Who Needs to Be Vaccinated? Ideally, every member of the family including adults and children aged 6 months and up should get a flu vaccine. This is to ensure that family members will not be passing on the flu virus to each other when they get exposed. However, there are specific guidelines for this. The American College of Allergy, Asthma and Immunology has clarified that the egg protein contained in flu vaccines are very low and is therefore not expected to cause any allergic reactions. However, it would be wise to consult a doctor when in doubt. Also, there is now a flu vaccine with no egg content in it. The best time is the start of summer which is several months before the flu season coinciding with the rainy season. The months of February to June are considered ideal. Flu vaccines have to be given yearly because of the change in prevalent virus strains each and every year. What are the Forms of Flu Vaccine? fever and achiness lasting for 1-2 days. that is it less effective in certain age groups particularly the elderly. In our desire to offer our children the best protection we can provide them, my husband and I make it a point that they get their yearly flu shots in time. Even when some questions are being raised about the safety of using specific vaccines, we are continually hoping that the risks involved would be zero since the well-being of our children is the primary reason why we go through this every year. That said, it should be noted that it would take about two weeks before the protection offered by the flu vaccine takes effect that is why it makes sense to be vaccinated several months before flu season starts. I told my daughter that she has to give time to wash her hair properly. It needs to be shampooed and conditioned and washed thoroughly to remove all residue. I have noticed that she tends to rush it especially when her playmates are already calling her. The only solution here is for her to take a bath earlier so she will have enough time to wash her hair properly and comb it afterwards. I didn't have to tell her what to do with her hair when she is doing her toilet business. She automatically puts her hair on one side and keeps it there until she's done. Lice infestation became a real challenge to us last year. Her hair got damaged by the repeated treatments of over the counter lice shampoos. Although having short hair does not guarantee a 100% lice-free hair, it does make hair management a lot easier. I asked her to observe the preventive measures I taught her like not sharing combs with her schoolmates more seriously. I explained to her that we might end up cutting her hair whether she likes it or not if this problem persists. Fortunately, she heeded my advice. 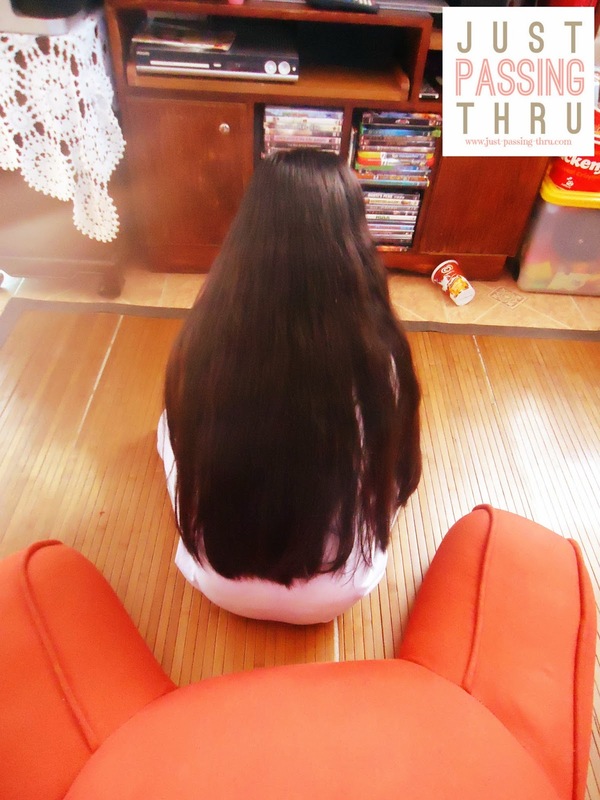 Long hair can get in the way of children's play and certain other activities. To lessen the risk of having hair tangled with some object while playing, we have agreed that her hair must be tied securely. Upon my advice, she always has at least one hair-tie in her pocket, just in case it would be needed. My daughter usually has her hair down with some clips to keep it off her face during schooldays. For the PE day however, her hair is tied pony-style or in pigtails. I really don't know what particular reason my daughter has in sporting very long hair. I can only guess that it makes her feel like a princess as most young girls tend to think. She also has her own notion that long hair makes girls more feminine. If you know my daughter, you'd know that she is for everything "girly". That said, I decided to make this hair issue an opportunity to teach my daughter about responsibility. If she wants it that way, she must do what is needed to maintain it right. Convenience is king in many homes, especially for those people with increasingly busy lives. Between work, school, and play, most people need a break from everyday stressors once stepping foot into their respective castles. Fortunately, there are a range of great items that make everyday living a breeze. From having a rolling step stool in places like the kitchen to closet organizers for compact areas, the following items will make your home a relaxing place to live. People sometimes need a little assistance hauling heavy items, especially for work around the house. A great solution to home hauling problems is a hand truck. These easy-to-use devices can take the burden of heavy or bulky items and make moving things around the house a breeze. Hand trucks are often able to be folded for easier storage when not in use, which makes them highly convenient for traveling as well. Items stored in high places can be a pain to reach for many members of a family. That’s why it’s important to keep things like stools and ladders in one’s home. For quick job, a rolling step stool is a great way to access those hard to reach shelves and cabinets. This item is perfect for a number of rooms in a home, from kitchen to office and everywhere in between. Many stools are available with a convenient locking mechanism, which is a must for added safety when trying to reach those hard to get to places. 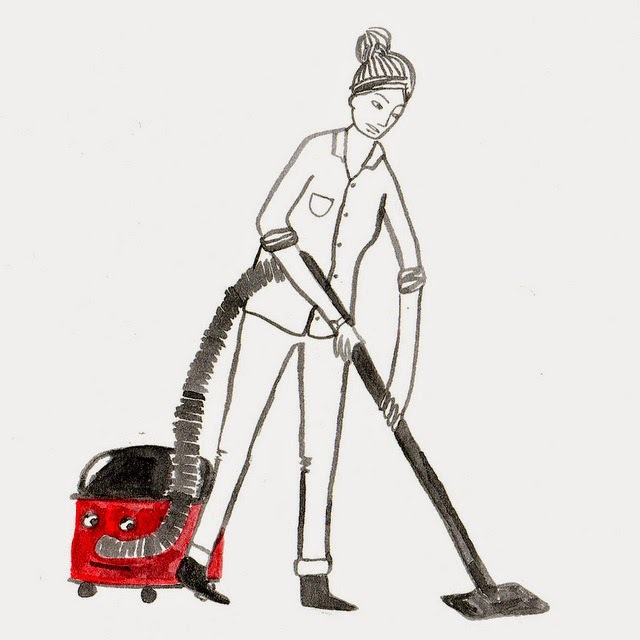 No one actually enjoys doing dishes, but like most other household chores it must be done. When hand-washing dishes, a rack that allows for air-drying is a great investment. These racks will keep items separated, allowing for dishes to drip dry without the mess and fuss normally associated. Some racks even come with a spigot mechanism that allows run off water to be filtered back into the sink. This will save the time and headache typically associated with doing dishes. Working from home can be incredibly convenient, provided one is working within a well-organized space. Fortunately, there are number of great items that can keep any office running smoothly. Mobile carts are a great way to ensure useful items are always on hand, no matter where one might be working. This is especially true of those involved in a lot of home projects, which can require a number of different tools at a moment's notice. Most people would probably lament the current state of their closets. However, even the messiest of closets can be salvaged with a little bit of help. Thanks to the numerous shelving options and adjustable height and width, an expandable closet organizer can be the perfect choice for just about every home in need of some sprucing up. Shelving works great for shoes and other items, and with the ability to fully customize a unit, worrying about closet space is sure to become a thing of the past. A well-organized home is often a happy home, and the above items can play a role in ensuring one's home is both a relaxing and efficient place to be.